Head and neck injuries are some of the most commonly sustained injuries in accidents that involve blunt force trauma, such as falls and car crashes. There are, however, a number of other injuries that can be just as serious as head and neck trauma, including nerve damage, which generally occurs in one of three ways, namely: pressure, stretching, or the severing of the nerve itself. Whatever the cause, this type of injury tends to have especially severe consequences and can make it difficult, if not impossible, for an injured party to return to work. 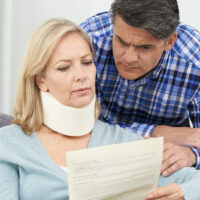 For this reason, seeking compensation from the party who caused your accident can play a critical role in ensuring that your medical expenses and lost wages are covered. To learn more about filing a claim against the person or entity who caused your own car crash, please contact a member of our car accident legal team today. Lacerations, which can result in the partial or complete severance of the nerve itself. The cause of a person’s nerve-related injury plays an important role in treatment. For instance, when a nerve is severed, repair requires surgical intervention, while a nerve that has been stretched or pinched may require physical therapy and medication to manage pain. The symptoms of nerve damage are also wide ranging and include everything from full or partial paralysis of the limbs to increased sensitivity on the skin and muscle weakness. Of the many types of nerve damage that a person can sustain in an accident, neuropathy resulting from blunt force trauma is one of the most common, especially if the nerves affected fall under one of the following categories: autonomic nerves, which control the systems of the body, motor nerves, which allow movement, and sensory nerves, which control sensation. Diagnosis usually involves the performance of nerve conduction studies, nerve and skin biopsies, and electromyography. Unfortunately, peripheral nerves regenerate at a much slower rate than other nerves, so treatment for those who are diagnosed with this condition may only involve pain management, although physical therapy can help victims regain strength and avoid muscle spasms and cramping. Non-surgically, which involves rest, exercise, medication, and physical therapy. In either case, treatment can be expensive, so it is critical for those who were injured as a result of someone else’s negligence, to speak with an attorney about seeking compensation for their losses. Please call Boone & Davis at 954-566-9919 to schedule a free case evaluation with an experienced Fort Lauderdale car accident attorney.